Oh my gosh you guys! 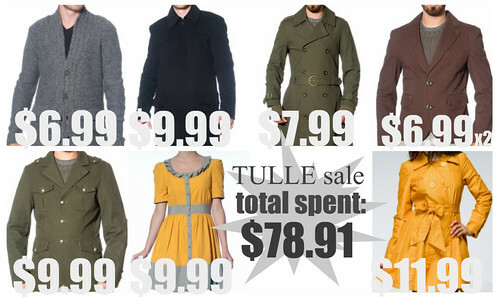 Today is the secret sale day at Tulle, and boy howdy, did I clean up for Hubs! Yes, The Man Makeover is still going strong. I've been taking pictures, but most of the outfits have been repeats, thus my lack of vigor for timely updating. That's all going to change once this Tulle/ Cloth Logic order comes in. Seriously! I just got an adorable $6.99 grandpa sweater for him (down from $78), a $9.99 winter coat (from $145), a $7.99 trench (from $133), two $6.99 blazers (orginally $95 each), and an insanely hot $9.99 military jacket (from $118). Nothing was over $10! LOOK! I used BOLD. That's how excited I am! Of course since I had his debit card handy, I went ahead and got myself the $9.99 yellow button down dress (from $95) from my wishlist and an $11.99 yellow trench coat (down from $115). TOTAL RETAIL PRICE: $874. I saved $795.09, which is a 91% SAVINGS. My living room just became fist pumping central. I'm going to be busy congratulating myself for the remainder of the evening. You, too, can experience the secret Tulle sale. Just go here and shop toward the top of the page.